There is a A$2.00 ground transport charge for taxis leaving each of the terminals, which is applied to improving ground transport infrastructure. The fare will vary of course, depending on your destination and the location of the property. A single fare to Cottesloe, for example, will cost around A$55.00-$60.00. There is no extra charge for luggage. A charter limousine vehicle can be pre-booked to meet you at either the domestic or international terminal and transport you to your destination. Phone +61 (08) 9477 1302. Phone: +61 (08) 9277 9277. Phone: +61 8 9226 5033. Perth Airport Shuttle has pick-up points near hotels, motels and hostels in and around Perth city. A shuttle meets every international and domestic arrival. Tickets are $15 per person one way. There is no need to book, you can purchase a ticket from the driver on the day of travel. 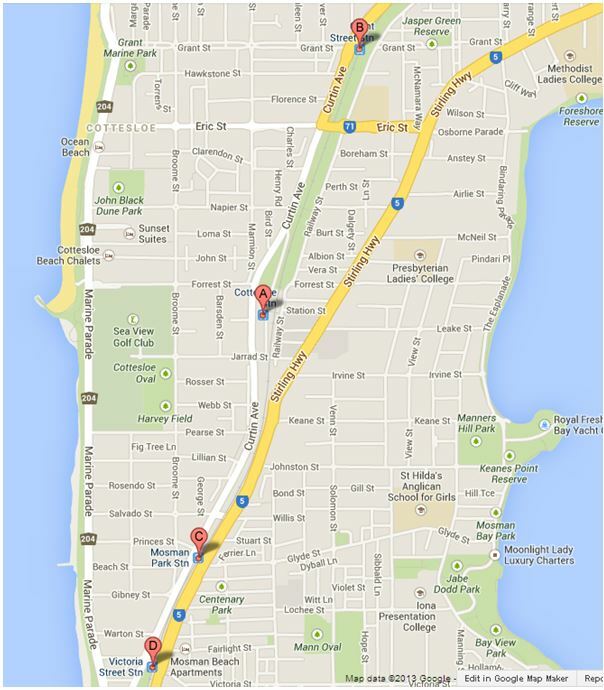 After arriving in Perth City we suggest either calling for a taxi or catching a train to the Cottesloe area. For more information on public transport in Perth visit www.transperth.wa.gov.au, or telephone 13 62 13 (if you are calling from Australia). Trains start a little after 5:00 am (later on Sundays) running at least every 15 minutes during the day. They reduce frequency to every half hour after about 7:30 pm, and are all but finished by 12:30 am, with the exception of a few late night train services. Two transit guards travel on every train service after 7:00 pm. For more information on public transport in Perth visit www.transperth.wa.gov.au, or telephone 13 62 13 (if you are calling from Australia). Please note there is no train line from the Perth Airport.